New York Mills Senior Center | Liberty Affordable Housing, Inc. Built on the site of an abandoned knitting mill, the new complex reflects the original design of the mill. Liberty Affordable Housing Inc. worked closely with state and local municipalities, especially the Village of New York Mills, to complete the project. Liberty was able to maintain the original building’s sense of identity, while offering functional and productive space for the community. 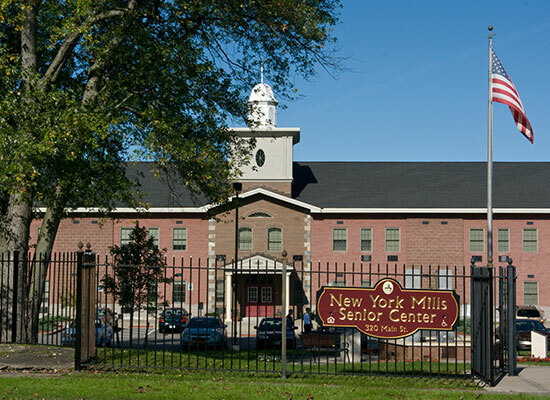 As part of the overall New York Mills Senior Center project, Liberty provided the Village of New York Mills with a 3,550 square foot ground-floor community room with parking for their senior citizens. The property’s features and amenities include a community room with free internet access, laundry, extra storage, ENERGY STAR appliances and automated entry doors. The site was acquired in 2005. Construction of the new building was started in 2006 and was completed in 2007. Funding Sources: NYS Division of Housing & Community Renewal’s 2005 Unified Funding Round for 9% Low Income Housing Tax Credits and Housing Trust Funds.